Last Thursday saw AFC’s under 17 team make the long trip to Stornoway to face a local select squad as part of the Lewis & Harris Junior Football Association’s 70th anniversary celebrations. The Dons were greeted on the island by the extremely supportive Steven Munro who chauffeured the squad to Stornoway Castle for a swift visit, prior to heading to the local council for a pre-match meal. Aberdeen were welcomed by a warm reception from a substantial crowd at Smith Avenue Park in expectation of a highly competitive fixture on the 3G surface. The Dons started with MacPherson, Wilson, Anderson and Laurence as a back four in front of U15 goalkeeper Archie Mair. Hynes, Youngson, Taylor, Morrison and Koshoedo made up the midfield with Dangana playing as a lone striker. The Lewis and Harris Junior U18 Select side shaped up in a disciplined 4-5-1 formation looking to soak up the pressure and then counter with pace. The young Aberdonians had the lion’s share of the possession early on and carved out a good opportunity when skilful winger Seyon Koshoedo glided past the left back and cut back a dangerous ball from the by-line, however the Islander’s managed to clear on this occasion. Although dominating possession and in control of the game, Aberdeen were struggling to break down a well organised LHJFA side, which is a compliment to manager Eric Macleod who demanded a high worth ethic from his side throughout the evening. The select’s smash and grab mentality was to pay dividends mid-way through the first half. Alex John Morrison played the ball over the Aberdeen defence and pacey frontman Luke Mackay took full advantage of some sloppy Dons’ defending by producing a neat finish into the side netting of Mair’s right hand post to send the hosts in a goal in front at the break. Scott Anderson demanded a second half response from his team and this was illustrated in the intensity Aberdeen played with after the restart. Dean Campbell and Jack Mackenzie were introduced to the midfield whereas Sam Robertson entered the back-line. 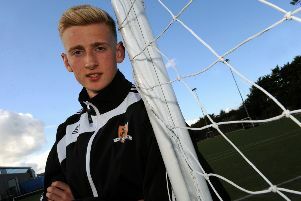 14 year-old Dean Campbell was an increasing presence on the game and nearly forged out an equaliser, but Hynes could not quite connect with his left-footed delivery in front of goal. However, Aberdeen were to draw level with twenty minutes remaining after the LWJFA goalkeeper was adjudged to have fouled in the box following a dangerous Aberdeen corner. Andy Youngson coolly stepped up and dispatched his spot kick to the right hand side of the keeper. From then on it was a barrage of Aberdeen attacks with Mair nothing but a spectator. With the game drawing to a close and a draw looking increasingly likely, Aberdeen took advantage of their continued pressure. Man of the match Seyon Koshoedo whipped in a bending left footed corner, which Joe MacPherson met six yards out to head into the net and complete the Aberdeen come-back. The game ended 2-1 to Aberdeen and credit should go to both teams for the fair and competitive spirit shown by either side on the night. Aberdeen’s fleeting visit was concluded by attending the LHJFA Player of the Year Awards, where LHJFA captain Callum Van was signalled out for his performance on the night and presented with an AFC signed strip and pennant. AFC would like to extend their thanks to all involved with the trip and look forward to returning at some point in the future.